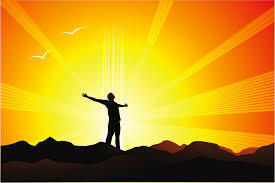 Mind, Body & Spirit programs enhance physical, emotional, and spiritual health. All programs are free and open to the public. THE SERIES: Programs are now scheduled month to month and added as speakers are available. This wellness and spirituality series initially began in 2013 thanks to a generous grant from the United Church of Christ Pilgrim Association. Mind, Body & Spirit programs enhance physical, emotional, and spiritual health and wellness. Each evening features guided meditation, a spiritual reflection, a talk by a community professional, and usually feature an experiential workshop. Currently, programs are scheduled month to month. How do I protect my money and my house from being taken for nursing home costs instead of them going to my kids? How does my family avoid lengthy and expensive Probate for my money and my house when I die? In December, John Dowd Jr. joined us. He's an XM/Sirius broadcaster and author of Heroes, Mentors and Friends,. John told that slowing down our busy 9-5 technology driven lives can actually speed up our personal and spiritual growth creating meaning in our life. In October, we talked about hands-on healing. 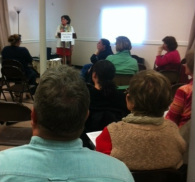 Reiki Master/Teacher Veronica Shaffer shared the healing benefits of Reiki. Ronnie and other practitioners offered chair Reiki sessions to group participants. In September, our topic was "Making Peace" and we learned about Nonviolent Communication from Brenda Nolan and Richard Magan, both NVC practitioners and facilitators. NVC provides people with a toolbox of resources for having needs met and resolving conflict with empathy and compassion. Rather than assessing the world through the lens of “shoulds” and “deserves,” and separating people into categories of “good”/“bad” and “right”/“wrong,” and threatening punishment, NVC affirms the humanity in every person and makes clear requests for what is wanted instead of what isn’t wanted Judgments and criticisms can be replaced by observations. Instead of living in fear of the effect of unwanted feelings, they were now valued signs to determine what basic human needs were not being met. Demands could be translated into requests. For more on NVC, click here. Seasons of Change was our August topic. We explored losses with Nancy Jo Haberman, LICSW, the Bereavement Coordinator at Hospice of the South Shore, South Shore Hospital.Nancy Jo has over 20 years experience working in the field of hospice, end of life care, loss, grief, addictions, mental health and recovery. She is in private practice offering individual and group therapy. Elizabeth Kubler Ross says that when we die we're allowed to shed our bodies as a future butterfly sheds it's cocoon. Then we're free. Free of fear. Free of pain. Free of worry. 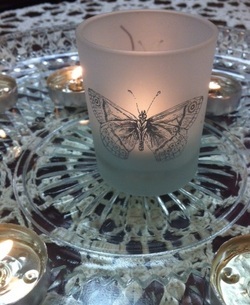 Free as a beautiful butterfly, returning home to God. For area resources, click here. To find a local GriefShare Group, please click here. For online resources, please click here. In July, our program was called, "Go with the Flow" and we talked about the flow of energy within and around us. 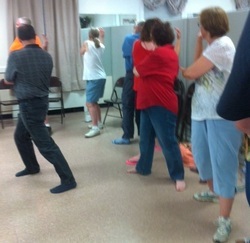 Mike Heart taught us Tai Chi and Cinzi Lavin led us in Chair Yoga. In June, our program was called "Embracing the Arts" and professional artist and local art instructor, Jonna Sundberg shared the Henri Matisse techniques for 'painting with scissors'. In April, we talked about transforming unhealthy habits and recovering from addiction. Information and resources were available for ﻿﻿anyone affected by addiction. ﻿﻿ Speakers included Lyn Frano, Weymouth Substance Abuse Prevention Coordinator; Pharmacist Dave Morgan; Merielle Paul of the Learn to Cope Family Support group, Warren Nicoli and Elizabeth Sanchez, Narcan and Prevention Educators from the Manet Community Health Center; and Haley, a young woman in recovery; and local treatment providers. In March, our theme was exercise. After a brief reflection on the physical, emotional, and spiritual benefits of exercise; we heard from guest speaker Loren de la Salle, owner of Fuego Fitness on Bridge Street in Weymouth. Loren talked about the transformational benefits of exercise and led us in a free Zumba lesson. Learn about Fuego Fitness at FuegoFitnessWeymouth.com. In February, "Financial Freedom" was our topic and our guest speaker was Scott Sullivan from Money Management International, Inc. (MMI), the largest nonprofit, full-service credit counseling agency in the country. Scott taught us about budgeting (having a spending plan) and gave us lots of valuable information about credit reports. 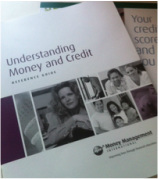 For free consumer credit information and services, please visit MoneyManagement.org. Pilgrim held a clothing drive to benefit Weymouth Youth and Family Services. 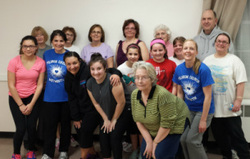 In January, our program was entitled "A Healthy New Year". Piper Mount from Share Our Strength's Cooking Matters joined us to talk about nutrition and to give us a cooking lesson. In the workshop, we made delicious black bean tortillas with mango salsa. To learn more about Cooking Matters, please visit CookingMatters.org. A nutrition-themed follow-up volunteer event invited folks to prepare and serve a meal at Father Bill's. 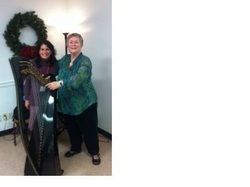 In December, the program was "A Stress Less Christmas" with harpist and music therapist Joanne Cavatorta. After the talk, we made simple Christmas decorations. As a follow-up volunteer opportunity, we went Christmas Caroling at Colonial Nursing Home in mid December. In November, the evening was dedicated to "An Attitude of Gratitude". Curry College Professor Dr. Brecken Chinn explored gratitude. We made blessing boxes and gratitude journals. There was also a Thanksgiving-themed volunteer opportunity with the Weymouth Food Pantry.